Advanced Renamer is the best free application for renaming multiple files and folders at once. By configuring renaming methods the names can be manipulated in various ways. It comes with 14 different methods to change the names, attributes, and timestamps of files. 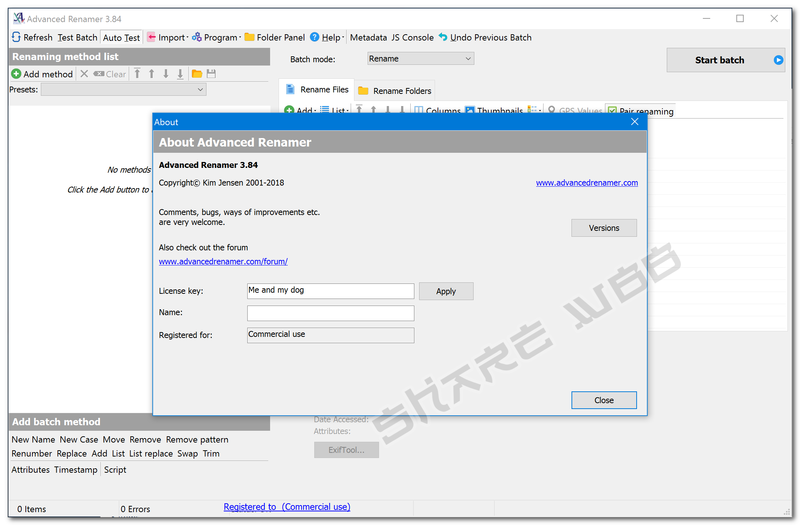 With Advanced Renamer you can construct new file names by adding, removing, replacing, changing case, or giving the file a brand new name based on known information about the file. Before performing the operations on the files you can verify that the output will be correct and if you perform the rename and regret it, you can undo the complete batch. Note: it’s totally free if you use it for personal purpose. This mass file renamer is a great utility for organizing digital pictures for both professionals and beginners. The thumbnail mode lets you display thumbnails directly in the file list giving you maximum control of the renaming process. With this program, you can rename all your photos in a snap. If your image files contain GPS data you can add the name of the city and the country where the picture was taken. Coordinates are used to lookup city, country, and state names from a database containing more than 100,000 cities around the globe. MP3 and other music files often have messed up names and contain weird characters. With Advanced Renamer you can change the names of your favourite music files to more suitable names using the built-in ID3 functions. Ever wanted to add the codec or the resolution of a video to the filename? With the video tags you can add various information about video and audio content to the names. Add episode title or airdate to video files containing TV Shows after importing show information from the tvmaze.com website. Add a prefix or suffix to filenames. Change existing numbers in filenames. Trim unwanted characters from beginning and end of filename. Add GPS coordinates or reverse geocode coordinates to add city name to file name. Categorize video files by use of video tags. Perform automatic batches through the console batch runner. Randomize filenames for use in digital picture frames. Rename TV shows based on season and episode details. Quick cleaning of files downloaded from the internet. Flexible and efficient batch automation. Organize images and videos downloaded from iPhone or Android.